I saw The Force Awakens Thursday night, but I wanted to wait until the weekend passed until I posted about it. First, it was magnificent. I want to shake JJ Abrams’s hand for revitalizing the franchise. Second, Disney can go to hell for declaring most of the expanded universe books non-canon (though they still plan to incorporate some of it). They were great. In my mind, I’ll always consider them an alternate reality, like DC’s Earth-2. Those books are too good to be forgotten. Now for what I really want to talk about: The Dark Side. Psst. 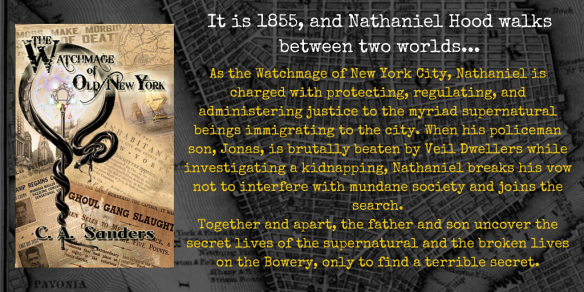 My novel, The Watchmage of Old New York, is only 99 cents until New Year’s Day. The reviews are incredible so far, and if the popularity of the serial version says anything, it’s that you’ll love it. Spend a dollar, find your new favorite book. As a child, what terrified me about Darth Vader (and later compelled me as an adult) is the cold, emotionless way that he committed terrible acts. There was never any rage in him. He simply did it. It was as if he was stripped of all humanity. Of course, we later found that some humanity still existed in him, but that was what led to his redemption. It was the light side shining through the shadows. In contast is the Sith apprentice in The Force Awakens, Kylo Ren. He is a simmering pot of rage and fear. He still contains emotions, and that’s why he’s not as powerful as Vader. That he has such idol worship for Vader (and fear that he’ll never become as powerful as him), is a great touch to his character. The prequels, while not particularly good, did an excellent job of exploring The Dark Side and Anakin’s descent into it. I’m reminded about what Yoda said: Fear leads to anger. Anger leads to hate. Hate leads to suffering. Anakin goes through each stage in order, eventually leading to his full turn to Vader. I used to think of the “suffering” as making other people suffer, but a friend recently brought something up that made me reconsider this. Anakin fears for Padme, and that fear leads him to killing the Jedi. But it’s not until he suffers, when Sidious tells him that Padme died, that he truly becomes Vader. He had to lose the thing that he loved the most in order to succumb to The Dark Side. What he lost wasn’t just Love. It was Hope. If The Light Side is Hope. The Dark Side is the absence of it. Lucas calling Epi IV “A New Hope” takes on a new meaning. Luke goes through a similar struggle, though he’s able to win in the end. The moment when he almost succumbs to the Emperor is when the Emperor tells him that The Death Star is fully functional as his friends are doomed. 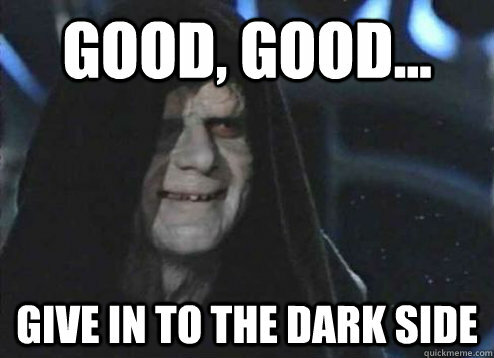 Sidious/Palpatine casts him into ultimate suffering. But Luke clings to hope and shakes off the final act that would make his transformation complete. The question I ask about The Dark Side is: if you have to suffer in order to become a Sith, does that make the Sith martyrs? They sacrifice their humanity for love, like Anakin or for duty (like Jacen Solo in the expanded universe novels. Maybe duty isn’t the right term…it’s complicated). This adds a certain amount of complexity, even heroism, to the Sith. Who did Darth Maul sacrifice for power? What about Palpatine? One of the themes in my novel Song of Simon, is that heroism comes from sacrifice, and I believe that. A hero has to be willing to give up something precious for the greater good. If that’s true (and The Hero’s Journey confirms it), that the Sith are all tragic heroes where their sacrifice was too much to bear and consumes them. It’s poetic irony: the heroic act leads to unspeakable evil. I like it. The only difference between the Light and Dark Sides is how the hero responds to their sacrifice. You can either be like Luke and keep hope, or be like Anakin, and lose it. This entry was posted in TV/Movies and tagged dark side, kylo ren, movies, star wars, the force awakens, vader by C. A. Sanders. Bookmark the permalink.